When The Hobbit: An Unexpected Journey opened with a 48 frames-per-second presentation in some theaters last year (twice as many as the industry-standard 24), you found very little praise for the new format online; take the usual bellyaching about 3D and amplify it, and that's roughly what came out. I was sort of with them, although I had a very hard time deciding whether my unease was because the super-smooth movement (and a number of other effects which I don't know enough about cinematography or human vision to quantify) was objectively inferior or simply different enough to require time to get used to it which likely won't come. There were far fewer HFR screenings of the second part this fall, whether because audiences genuinely rejected it or because Warner Brothers just decided it didn't need to deal with this debate again on a yearly basis; they certainly put less emphasis on it in the promotions. 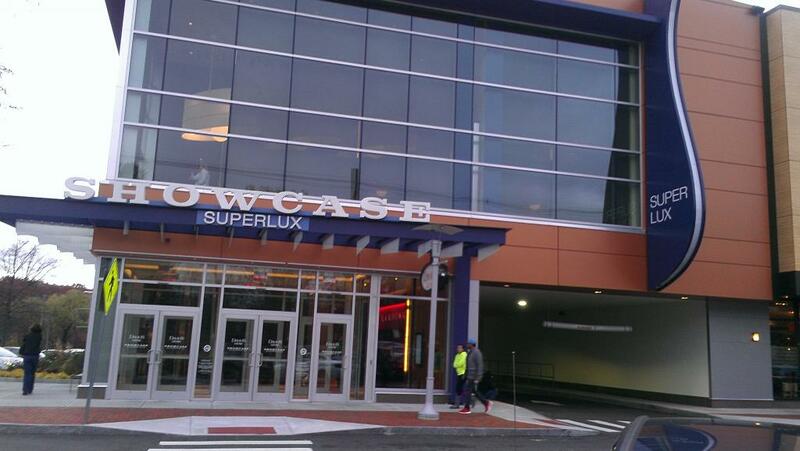 As a result, by the time I could actually see it, the SuperLux was actually the most accessible location. At this rate, it will be a "you'd better see it opening night" situation next year. Similarly, I think I could get used to seeing movies at the SuperLux, although there are things about it that initially strike me as "wrong", even though I'll generally argue that there's no wrong way to enjoy a movie with the general exception of when it interferes with someone else doing so, which is less "you're doing it wrong" than "you're doing it at the wrong place and time". It has its good enough points, though, even I don't think I'd want to see the majority of my movies there. For a "premium" theater, it's unassuming enough from the outside, opting to understate its high-end contents at street level rather than come across as obviously luxurious and decadent. It's at the end of "The Street", a string of shopping plazas that merge into one through similar dimensions, style, and tone - you won't find thrift stores there, but you also won't find many places that come off as way out of a middle-class suburbanite's price range. Fun trivia - to get to this theater from the Chestnut Hill T station, you have to walk past the vacant space of old AMC Chestnut Hill, which still looks like the old 1970s-era cinder block it was. Once inside, you're confronted by touch-screens and escalators, and the touch-screens are my biggest beef with the place - I often have dreadful luck with touch interfaces, and these ticket kiosks are occasionally difficult to use. For some reason, each movie is listed twice, once for the "LuxLite" seating and once for the "SuperLux" seating, but just looking at the screen won't necessarily tell you which is which if you don't already know those names, as they are distinguished by an alphanumeric code after the movie title. Once you've chosen your movie, and price level, it brings you to a screen that allows you to choose your seats, which is also not a great interface; the color coding is not immediately obvious, the individual seats are too small on the screen, and on my first visit I was actually unable to choose a seat and had to go to the concierge desk. It also appears that the first couple of rows are locked until the rest of the "LuxLite" seats fill up, something I'm of two minds about - they are fairly close to the screen, but I'd rather sit front-row center than at the end of the third row, and seeing them empty but not being able to select them frustrated me. Note that less-than-ideal interface design on the kiosks isn't unique to this theater - I have my issues with the ones at AMC and Regal as well - but it is kind of frustrating because there is no traditional box office for those who prefer interacting with a human being even if they are not frustrated by not being able to get the machine to do what they want, especially since they're paying a relatively high price for service and the place can feel overstaffed in other areas. It's impersonal and could be much improved by either having a more intuitive interface on the touchscreens or a visible customer service representative (or, ideally, both). Once you've got your tickets, the next step is the lobby. It's a pretty terrible picture, but it gets across how tony the place is. The desk on the right is an island that serves as the "concierge desk" for customer service. When I had to use it to get into Gravity, the folks were nice, but things moved slowly, in part because a place like this thrives on the feeling of personal service, so making sure the person at the desk right now feels important can feel like more of a priority than getting to each one of the people in line who would like something resolved before their movie starts at a fixed time. It doesn't help that the software at the concierges' disposal appears to be just as user-friendly as the customer-facing stuff; it seemed to take forever to switch modes, open up seating, etc. The thing that struck me most about this area, though, is how quiet it was compared to a typical cinema lobby. There are no video games or vending machines, no five stations of people ordering tickets or snacks, no lines, and not really a whole lot of people hanging around waiting for the last show in their theater to get out or for friends to show. Even the piped-in music is fairly sedate. It's not bad, per se - if you're like me, you'll just be walking straight through this area; if you're not, maybe you'll order a cocktail at the bar, have a meal at the attached Davio's Steakhouse, or gather with your friends around one of those little tables that puts your group close enough to each other but far enough from anyone else that you don't have to make your voice carry. It's nice, but not what I'm used to - I take public transportation to multiplexes or neighborhood theaters with tight lobbies where you might have to stop at the box office, the concession stand, and a bar to get everything you need before awkwardly presenting your ticket with your hands full. There are days when I don't like the noise, but I've gotten used to it, and the lack of it seems like a demonstration of how part of the appeal of the SuperLux is keeping the riff-raff out, and some part of me wants to declare that movies are for everyone, that the fact that cinemas are one of the places where we rub elbows with people of different classes and backgrounds is a good thing, as opposed to this yuppie enclave. On the other hand... Yeah, it is nice to hear yourself think, relax, maybe loosen up with a beverage if that's your thing. It is, in fact, quite pleasant to know that the guy in front of you is working exclusively on getting things right for you rather than just wanting to keep the line moving. The traditional cinema lobby is communal, but it's full of people going a dozen different directions, and quiet order is a worthwhile alternative to the usual. Whatever you think of this room, there's a ticket-ripper on the other end who will direct you to your theater. There, you may see what I mean about the place sometimes seeming a bit overstaffed, with four to six ushers waiting outside the room to show you to your seat. Again, it's a bit weird to me; even in places with assigned seating like ballparks or concert halls, I'm used to figuring out how the rows are numbered and just sitting down, and that effect seems amplified when you're a single moviegoer walking past a crowd of people who seem taken aback that you might seat yourself. Just remember, though, that despite the big screen at the front of the room and the neatly arranged rows of seats, this is in many ways a restaurant more than a theater, and there's nothing strange about being shown to your seat in a restaurant. Here's the thing - once you get into your seat, a lot of the things that may have seemed strange or off-putting before fade to the background, because what goes on in here is fairly excellent. Not perfect, at least to my way of thinking, but my priorities aren't necessarily those of the SuperLux's target audience. 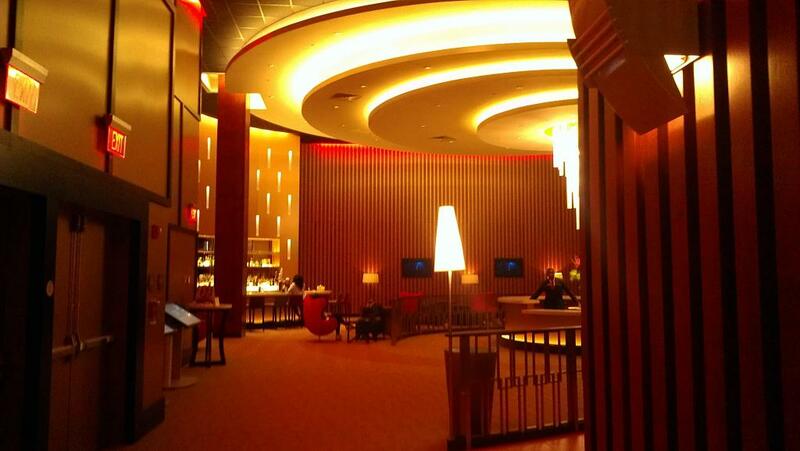 I want nothing between me and the movie; this place is built to offer, as the name says, super-luxurious service. The basics, at least, are well-covered. All six screens are fair-sized, especially compared to the cozy 80-100 person capacity and dimensions of the room, and they all feature 4K Sony digital projection with 7.1-channel surround sound. I believe they are all 3D capable, and from what I've read, the captioning and amplification devices for those who need them are state of the art LCD glasses, as opposed to finicky listening devices or mirrors that must be positioned to capture a marquee above the projection booth. Now that I think about it, this may be the first theater in the Boston area that was built to be fully digital, rather than replacing or existing next to 35mm projectors, and the clarity suggests that this certainly doesn't hurt. No ads play on the screen before the movie's start time, and the movie itself is preceded only by theatrical trailers and a bumper for the theater. It's a bummer that this is worth mentioning, but it is. The seating is comfortable as well, with wide, soft-but-firm seats that have a swinging desk surface on which one will find menus and, for 3D movies, glasses. It's pretty nice to have a flat, steady surface to place your concessions on. If you shelled out the extra $8 for the "Superlux" seating, there are buttons on the side of your chair that reveal it to be a motorized recliner. It beats out the RPX screen at Fenway for the best local movie theater seats at an establishment whose primary purpose is not selling furniture, and those extra little practicalities put it right up there with Jordan's. Then there's the menus. If you sit in the front "LuxLite" section, you're given a lighted booklet with drinks on one side and food on the other, and the wait staff will try and serve you before the movie starts (no orders will be taken after the lights go down, but they may be brought to your seat); if you sit in the "SuperLux" section, the menu is a tablet computer - the website calls it an "IPad", but the dimensions are closer to my Android Nexus 7. I was initially confused, trying to figure out how to order directly from the tablet, double-tapping and flicking once the item I wanted was on screen; instead, you hit a call button on the armrest and a waiter will come to take your order, even during the movie. The food is pretty good, although the selection is much broader in the SuperLux rows. 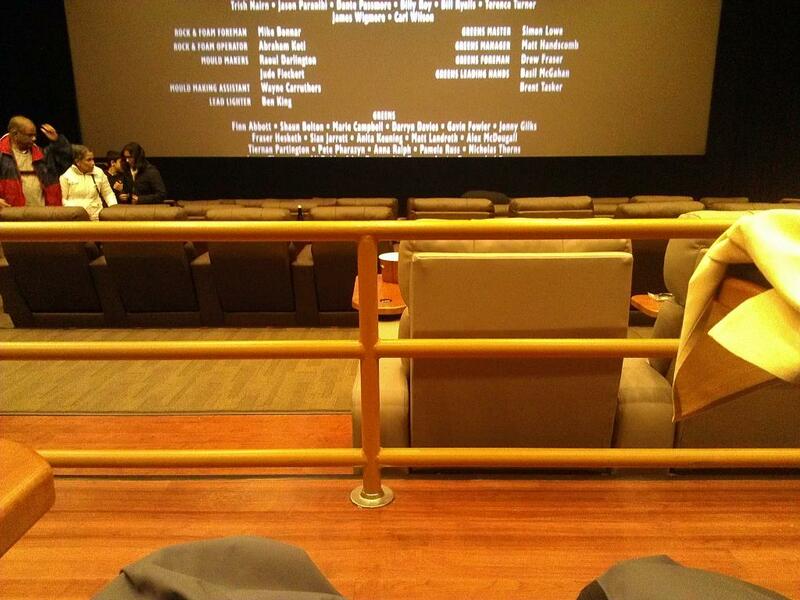 When I sat in the LuxLite section for Thor: The Dark World, I had some chicken tenders and fries. Pretty good, though I might have liked a little more meat and a little less batter. When seeing The Hobbit from the SuperLux seats, I ordered the Korean sirloin steak with mashed potatoes followed by the key lime pie, and that was definitely satisfactory! It was also a sign of the level of service a premium seat includes that you could specify how long you wanted between the (hypothetical) appetizers, main course, and dessert being served. I'm not sure whether having a waiter bring you a steak during your movie or having him or her deliver a bag of Peanut M&Ms is more indulgent, but it makes the whole movie experience excellent. Popcorn is complimentary in the SuperLux section (not in LuxLite), and be aware that your $4.50 soft drink is restaurant-sized, not cinema-sized. Alcohol is served. It has taken me three visits to get to know the place well enough from the inside that I can purchase my assigned seat with confidence. One thing you may notice from the photograph is that while the place features what is technically stadium seating, it's a much gentler slope than what is currently in vogue. And while there is more leg room in the LuxLite seats than at a typical theater, it's still a bit of a squeeze for the waiter to bring you your snacks, especially if the lights have already gone down. It's not quite as perfect a set-up as the Austin Alamo Drafthouse locations I saw some SXSW screenings at five years ago, where a steeper stadium slope and a walkway behind each row of seats allowed food to be delivered without stepping on toes or disturbing anyone's eyeline. I actually wound up glad to be in the second row of SuperLux seating for The Hobbit; ushers walking between the sections still had their heads poke into view there, but it would have been worse in the first row seats that I would have purchased if they weren't already claimed before I got there. I recommend arriving early to make sure you can claim seats in the centers of rows; there are a lot of people walking through the audience at various times, and sitting in the middle not only affords you the head-on view that I prefer in all screens, but as a practical matter it keeps more people out of view. Given that I am on the thrifty side and can see most movies for rather less money using MoviePass (and less hassle - it's a bit of a hike from the Chestnut Hill T stop, although suburban folks who drive everywhere won't mind as there's a fair amount of parking), I probably won't go to the SuperLux very often now that I've satisfied my curiosity. Thus far, the film selection hasn't been the sort of thing that necessitates a trip out of the city, and that's a bit of a surprise to me; I figured a place positioning itself as being for the demanding moviegoer might have some restored classics or critical darlings as opposed to Jackass Presents Bad Grandpa. It makes sense, though - Showcase is trying to capture the people who don't like the movie theater environment by offering personal service at prices just high enough to keep the folks who aren't picky about how they see a movie out, and the "I hate going to the movies" crowd isn't necessarily looking for better movies. Still, I can see myself going there semi-regularly, and not just as a special treat. The prices may induce a little sticker shock - $20 for LuxLite and $28 for SuperLux - but they're actually not as bad as they sound. The official ticket prices, as far as the studios and box-office charts are concerned, are actually $15 and $23; the extra $5 can be applied against your food/drink bill. There's also no surcharge for 3D movies, and once that's taken into account, a LuxLite ticket paired with some candy and a soda that admittedly won't explode your bladder suddenly looks pretty competitive with the downtown multiplexes. SuperLux is an indulgence - I think my ticket, steak, soda, and pie cost me about $60 once tax and tip were figured in, and that's a pretty expensive night at the movies, albeit one that includes a better-than-decent meal. In many ways, this place is the opposite of what I would open if I had the chance, but the audience Showcase is courting doesn't match the niche I would try to fill given the resources to open my own theater. It's a very comfortable way to see a movie, and there's something very appealing about a place that tries to serve one segment of the audience very well as opposed to trying to make a place that offers something to everyone the way a typical multiplex does. ... but when it comes right down to it, it's the movie that's important, and at the end of the night, The Hobbit: The Desolation of Smaug did not ruin a perfectly good steak dinner. And while the pampering may certainly have contributed to me liking Smaug better than An Unexpected Journey, I think Peter Jackson has still made himself a pretty good movie here. Admittedly, some of the problems that plague the first one are still present in the second. I hope that, when all is said and done, Jackson doesn't just present extended editions, but also gives us a look at how the original two-part adaptation would have been like. Splitting the story into three has left it feeling stretched out, especially since I half-suspect that these movies are as long as they are (two hours, forty minutes) because even a long but not crazy 2:20 would have made breaking them into three rather than two harder to justify. This time, instead of ending on an anticlimax, the movie ends on a cliffhanger, but one that seems like a fairly random stopping point. Still, there is a great deal of pretty excellent material here. Martin Freeman's Bilbo, secretly carrying the One Ring, is starting to enjoy the fact that he's suddenly important and capable of doing great things, and Freeman does a fine job of showing how, as much as the Ring may be stoking this desire for personal glory that borders on recklessness, some of it comes from inside Bilbo himself. Gandalf's side of the story isn't quiet so interesting, but it's fun to watch Orland Bloom, Evangeline Lilly, and Aidan Turner play off each other. And Stephen Fry! Stephen Fry was an unexpected treat. Plus, the action - some of it is amazing. The barrel escape from the elves' dungeons at the center of the film is incredible, somehow managing to bounce from whimsical to not messing around with amazing grace. The choreography of it is Spielbergian, light on its feet, in constant motion, but with each action leading to the next so smoothly that it feels like watching some sort of dance. I suspect in the original conception, that would have been the climax of the first movie, with the second being more Smaug-centric. I love Smaug, though - for all that much of the final action sequence is somewhat drawn out, the dragon may be Weta's finest creation, and even with Benedict Cumberbatch's voice distorted, he's a fabulously realized monster and antagonist. I half-wonder how much of the change in the appearance of the film in HFR this time around is down to Jackson and company understanding what works for a feature better and how much is pushing the look closer to that of the Lord of the Rings trilogy. There's a definite change in perspective here, somewhat less the bright, kid-friendly adventure of the first part as the darkness from the other set of movies starts to intrude, and the job Jackson does of forging that link makes me wonder what I'd remove to have a less-bloated Hobbit series. Making that short book this big has caused some problems, but also created some rewards.